Some 2 billion years ago, a natural-uranium deposit deep underground in what is now the west-central African country of Gabon spontaneously went critical. In the only known case of a nuclear-fission reactor forming naturally on earth, the Gabon deposit fissioned just like a modern-day power plant. As well as generating a substantial amount of heat, the uranium also produced a huge quantity of radioactive waste products, including around four tons of plutonium. Because this naturally occurring nuclear waste was buried deep underground, it remained remarkably well confined as it decayed over the course of millennia. Unfortunately, nature did a much better job of handling the by-products of nuclear power than we have. Last Friday, the Blue Ribbon Commission on America's Nuclear Future, which was set up by President Obama in 2010 to determine how the U.S. should handle nuclear waste, issued a draft report, and the verdict was not good. There are some 65,000 tons of nuclear waste now in temporary storage throughout the U.S., but in 2009, the President halted work on a permanent repository at Yucca Mountain in Nevada, following years of controversy and legal wrangling. 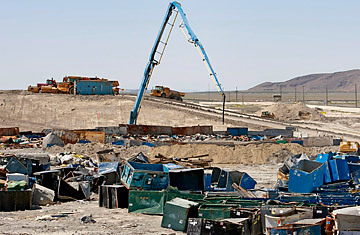 Few people in Nevada or elsewhere doubt the need for a safe and enduring place to stash radioactive debris, but no one wants it close to home. As it stands now, the Blue Ribbon Commission's draft report concludes that the nuclear-waste-management program in the U.S. is "all but completely broken down." If we doubted how precarious a state of affairs that is, the Japan earthquake and disaster at the Fukushima Daiichi nuclear plant served as a powerful illustration. Much of the waste we've accumulated over the years has been crammed into on-site cooling pools  the same kinds of pools that suffered problems in Japan. Even U.S. pools located nowhere near quake zones could be vulnerable to other natural disasters or terrorist sabotage. Fortunately, some simple steps can be taken immediately to make America's waste less hazardous, as the Blue Ribbon Commission notes. Spent fuel can be moved after a period of cooling from pools to dry storage in casks that are disaster- and sabotage-resistant and durable enough to store waste safely for many decades. The commission suggests that some of these casks be consolidated in regional, well-guarded interim storage facilities away from disaster-prone zones until geological repositories open up. Meanwhile, the commission also recommends that the U.S. government start a consensus-based process of finding new sites for such underground disposal facilities, though the commission stops short of suggesting just where they should be. Transparency is key: Sweden and Finland recently succeeded in this task in large part because they made the (honest) case that nuclear waste that remains above ground poses a much greater threat than buried waste, even to nearby communities. Most of the attention on the commission's work has rightly focused on its efforts to create a process that will lead to the opening of a new Yucca Mountainlike facility. But there's another, often overlooked aspect of its analysis that is equally critical: how U.S. policy toward nuclear waste can affect the spread of nuclear weapons around the globe. Nonproliferation campaigners have long warned about a method of handling nuclear waste called reprocessing, in which waste from reactors is chemically treated to isolate and remove fissionable plutonium, which can then be turned into a new fuel, called mixed oxide. That fuel can then be reused in reactors. In theory, reprocessing is designed to reduce the amount of waste at large and increase the efficiency of uranium-reactor fuel; in practice, it is prohibitively expensive, requiring subsidies to make viable, and does not obviate the need for the disposal of the massive quantities of radioactive waste that remain. More importantly, plutonium separated from nuclear waste during reprocessing can also be used to create nuclear bombs. Less than 20 lb. (9 kg) of the stuff could turn downtown Manhattan into a broiling wasteland of irradiated rubble. The Blue Ribbon Commission doesn't reach a conclusion on whether the U.S. should pursue reprocessing, arguing that consensus on the issue would be "premature." That is a mistake. Reprocessing is a manifestly dangerous technology. In the 1970s, the U.S. renounced commercial reprocessing at home and the spread of the technology abroad because of concerns that it would lead to weapons proliferation. It should not reverse this policy. The spread of reprocessing to countries in unstable or nuclear-armed regions gives them the infrastructure and expertise needed to quickly develop a bomb should they choose to do so. (And don't think safeguards imposed by the International Atomic Energy Agency can stop them. Commercial-scale reprocessing facilities handle so much plutonium that it is almost impossible for inspectors to keep track of it all.) The U.S. must send a message: if the country with the world's largest number of nuclear reactors renounces reprocessing, it delivers a clear signal to countries newly interested in nuclear power that the process is not necessary for the future of the nuclear industry. To its credit, the Blue Ribbon Commission suggests that the U.S. find other means to discourage reprocessing abroad. One comparatively simple idea would be for the U.S. to accept waste from countries in regions where an arms race might one day occur, effectively taking the possibility of reprocessing  and the weapons that could follow  off the table. Currently the Obama Administration is trying to negotiate such an arrangement through the International Framework for Nuclear Energy Cooperation. But here again the need for a U.S. disposal facility becomes acute. It's difficult for the U.S. to accept waste from other countries if it doesn't have a disposal site of its own. Nuclear waste has long been seen mostly as an environmental issue  but it's a critical global security issue too. Plutonium has been created only twice on earth. After the Gabon mines reaction, the next significant batch of plutonium arrived 2 billion years later in U.S. labs; it destroyed Nagasaki. Let's bury our nuclear waste  and, if necessary, nuclear waste from other countries  before it has the chance to bury us. Harrell is a research associate at the Project on Managing the Atom at Harvard University's Belfer Center for Science and International Affairs, and a Boston-based stringer for TIME. See the top 10 environmental disasters. In Fukushima city, decontamination begins. But what to do with the radioactive waste?